Folic acid is a coenzyme necessary for the synthesis of thymidine, which is required for DNA synthesis. The major nutritional source is vegetables. It is rapidly absorbed in the jejunum and transported from plasma into storage sites (primarily liver). The daily requirement is about 400 ug. There has been considerable interest recently in the importance of folic acid as a nutrient. Much attention has been given to the role of folic acid in the prevention of neural tube defects, as well as to the relationship between low serum folate levels and an increased risk of fatal coronary heart disease. However, the current primary use of folate assays remains the initial investigation of patients with macrocytic anemia (see macrocytosis). In 1996 the FDA mandated folate fortification of cereals and grains in the USA to reduce the risk of neural tube defects in pregnancy, resulting in a significant decrease in the incidence of folate deficiency. The prevalence of samples with low serum folate levels has decreased significantly over the past two decades as a consequence of food fortification. Although folate deficiency is now uncommon in the USA, evaluation of folate status is still indicated in a patient with megaloblastic anemia associated with poor nutrition, debilitation, alcoholism or malabsorption. Two tests have traditionally been used in the evaluation of folate status – serum folate and red cell folate. The rationale for measuring red cell folate has been that it more accurately reflects tissue folate stores than serum folate, since red cells acquire folate when they are produced, and the cellular concentration of folate does not change during the red cell lifespan. A single folate-rich meal can correct the serum folate in a deficient patient, while a persistently low red cell folate reflects chronically depleted stores. However, a study of folate concentrations in the liver (tissue folate stores) showed that they correlated equally well with serum and red cell folate. There are several significant disadvantages to the red cell folate assay, including a lack of specificity and sensitivity. Red cell folate levels are decreased in up to 63% of patients with vitamin B12 deficiency, and normal levels have been described in a significant number of individuals with documented folate deficiency. Furthermore, the red cell folate assay is more complex and cumbersome to perform than the serum folate assay, resulting in poorer precision and reliability, and increased cost. Recent studies have evaluated current test ordering practices in the diagnosis of folate deficiency. Several studies have shown good correlation between serum and red cell folate assays. A national pathology benchmarking review in the UK (J Clin Pathol 2003; 56:924-926) performed a 3 year analysis of folate assay ordering practices, and found 3 test-ordering strategies in the 45 laboratories studied – serum folate assay only (42%), red cell folate assay only (45%), and both assays (12.5%). The authors evaluated these approaches by performing a comprehensive literature review. In one study of 1355 samples submitted for folate evaluation, 57 had low red cell folate results, however in only 3 (5%) of these did this finding make a difference to the clinical outcome (that is, serum folate was normal, red cell folate was low, and the patient responded to folate therapy). In other words, red cell folate assay provided no additional clinical information over serum folate in 95% of the patients. The authors concluded that serum folate assay is the most appropriate screening test to detect folic acid deficiency. For the small proportion of cases (approx. 5%) where serum folate is normal, but there is a high clinical suspicion of folate deficiency, further testing is warranted. Some authorities have suggested that plasma homocysteine is a satisfactory substitute for the problematic red cell folate assay in this situation. An elevation of plasma homocysteine is a sensitive and early indicator of functional folic acid deficiency. In fact, there is evidence that a rise in plasma homocysteine may precede a decrease below normal in the serum folate level. 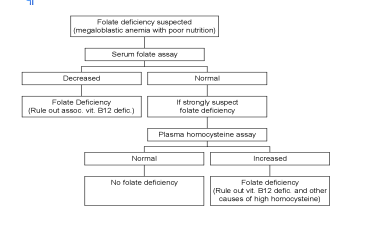 A normal homocysteine level makes the diagnosis of folate deficiency extremely unlikely. Of course, elevation of homocysteine is not specific for folate deficiency, and is seen in other disorders, including vitamin B12 deficiency (methylmalonic acid is also elevated in this disorder), pyridoxine deficiency, renal failure, and various enzyme defects in the homocysteine metabolic pathway. In view of the above findings, red cell folate is no longer needs to be performed. In cases of suspected folic acid deficiency, the testing algorithm above is recommended. Specimen requirement for serum folate assay is one SST tube, and for plasma homocysteine is one lavender-top (EDTA) tube. Fasting samples are preferred for both assays. The low prevalence of folate deficiency calls into question the common practice of simultaneously ordering folate and vitamin B12 assays. Folate deficiency, in the absence of megaloblastic anemia, is now rare in the United States. Even in patients with megaloblastic anemia, there are often clinical indications that would lead to ordering only one of the two tests. For example, a vegetarian is much more likely to have B12 deficiency, while a patient with poor nutrition is more likely to have folate deficiency. Vitamin B12 levels are often ordered during the workup of peripheral neuropathies, but folate levels are not indicated. Routinely ordering both tests not only doubles the laboratory’s work, but also increases health care costs. The most important cause of a falsely elevated red cell folate is a recent blood transfusion, due to the normal folate in the transfused red cells. A spuriously low red cell folate level may be seen in vitamin B12 deficiency, as described above. Causes of a falsely elevated serum folate level include a recent folate-rich meal, and even slight hemolysis of the sample (since red cell folate is at least 30 times as concentrated as serum folate). A falsely low serum folate level may be seen in the absence of megaloblastosis in patients with recent poor dietary intake, alcoholism, normal pregnancy, and in patients receiving anticonvulsant therapy. Reference range for serum folate is >3.4 ng/mL. Specimen requirement for serum folate is one SST tube. Fasting specimens are preferred because recent food intake may increase the serum folate level. The specimen should be protected from light until processing. Hemolyzed specimens cannot be used. The following substances may interfere with folate determination: heparin, ascorbic acid, fluoride, methotrexate, or other folic acid antagonist.